In Our Christmas Promise, Melissa Upton buys a special bridal gown ornament for the Christmas tree in her family’s bridal shop, Candlelight and Lace. She and her grandmother started the tradition, every year choosing a glass ornament or white bulbs made with lace, ribbons or satin from actual wedding gowns to hang on the tree decorated with a white tulle garland, tiny twinkling white lights strung around the branches and a tiny light-up tiara and veil on top. What a wonderful memory for a bride. Perhaps not all brides would want to cut up their wedding dress, but you can always find material and lace at a craft store. But for those who are thinking about giving away a dress or inherit a gown but don’t have the room to keep, this beautiful memento makes an exceptional gift. When I wrote the scene in Our Christmas Promise, it got me thinking about the times I’d made homemade ornaments for my family and friends. Years ago I was on a kick of cutting out wooden shapes and then painting the ornaments, personalizing them for special people in my life. The first batch was pretty basic, but after getting more involved in the hobby, my designs became much more detailed. Not to brag, but I got pretty good at manning a scroll saw. The safety goggles I wore when I worked were pretty stylish too! Many years before that, I cross-stitched ornaments. Cute Christmas designs that fit into tiny little frames to be hung on a tree. I enjoyed every minute of it, mostly because I spent time stitching with my mother and aunt. Lately, I’ve been too busy at Christmastime to indulge in any projects. I still make my own cards, but that’s about the extent of my creativity. 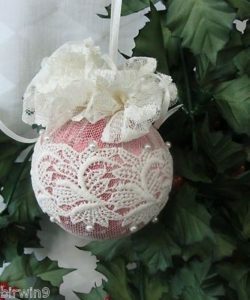 As I researched ornaments made from pieces of old wedding gowns, I decided to see just what new tradition I could create this year. 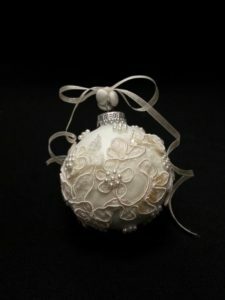 If you decide to make a wedding ornament, first, start with a styrofoam ball. From there, you cut lace, ribbons, and material to pin right into the ball. If you don’t have a wedding dress or choose not to cut yours, here are other suggestions for an ornament made of; a prom dress, baby clothes or blankets, children’s sporting team uniforms. I’m sure you can come up with more ideas. String a long strand of ribbon to the ornament to hang on a tree limb. Get creative to make one of a kind gifts. 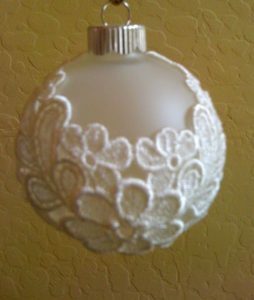 Or you can glue lace to a clear glass ornament. With other mementos, you can create very unusual Christmas gifts. Lace handkerchiefs from a veil. Tree skirt from a satin gown with lace appliqué. Picture frame made from wedding material. There are plenty of ideas to come up with. All you need is your imagination, materials and a few hours to have some fun. Invite friends over to create their own ornaments. If you can push pins or spread glue, this is a craft that can be done by any person looking for a unique Christmas gift. 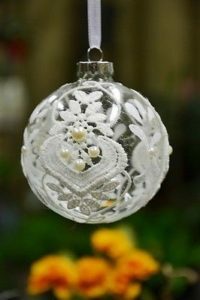 Or a beautiful way to make a cherished memory into a Christmas ornament that will be treasured every year.